Summer vacation is great time of the year. This is the time where parents and kids can bond well, spend time for each other by playing indoor games, enjoy watching movies together, gardening, decorate the house, take kids on short trips, picnics etc. 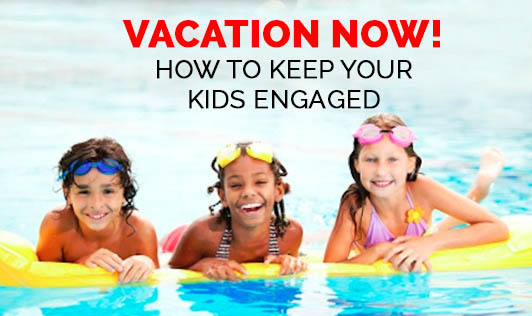 On the other hand vacation is one of the dreaded words for many parents, as it is difficult to keep them occupied on all the days, if the activities are not planned properly. So, how do you fill seven days a week with activities for the kids over summer vacation without overrunning your budget? Remember to first choose the activities that are best age-appropriate and then adapt them to the ability of your child. • Indoor activities - Interactive workbooks and reading can be their best friends while your kid is at home. This can be brainstorming and refreshing at any point of time and also you can prevent your kid from sun exposure. • Cook - Have kids help in the kitchen. Cooking utilizes skills and basic judgment. They may enjoy also learning to cook. • School activities -Schools organize various activities and programs during vacations. These would be of interest for children as they get to enjoy their favorite activities along with their school friends. Apart from music and dance, activities like art and craft give them ideas for their creation. • Outdoor camps - Older kids and teens may go for outdoor camps that include camping on hills, trekking, river rafting and many other such adventurous activities. This gives a different kind of exposure and confidence. They can also take part to organize such camps. • Swimming - To beat the summer heat, off late the first thing that comes to parents mind is swimming. It is a great summer activity for kids to stay busy. They exercise, have fun and stay cool. • Sports - Tennis, cricket, football, badminton, volleyball, etc are most commonly sought games that might interest your child and keep them busy the entire summer vacation. • If the building or neighborhood consists of many children you can encourage your kid to involve in activities. They can get together to perform a play or a musical act and they can be part of various tasks like writing the script, designing the invitations, playing instrument etc. • If the kids are very young, try and call the grandparents to stay at your place for some time. The kids love to pamper them, tell them stories and it will be enjoyable for the grandparents too. Last but not the least let kids be kids. Give the choice to them to select their activities they wish to do and be it any fun/ street games, make their holidays a great experience and the parents can even steal a few hours of precious time!